"The most important part about USC and about Thornton is the networking." 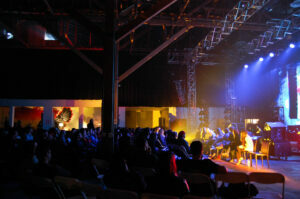 Production Club was founded by two USC alumni. On April 2, 2014, a group of Music Industry majors from the USC Thornton School of Music visited the offices of Production Club, a design and logistics firm founded by USC alumni specializing in solutions for production design, touring and special events. The trip, organized by Program Chair Ken Lopez, gave students a hands-on look into the skills needed to work in the production arm of the music business. 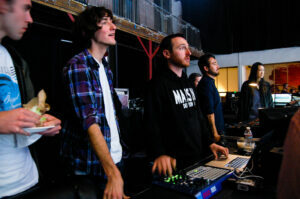 Music Industry majors observe a demonstration of the lighting effects created by Production Club for use in Skrillex’s live performances. 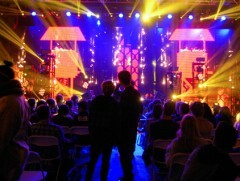 Production Club has created visual effects and lighting rigs for artists such as Skrillex, ZEDD and more. Many of the individuals involved with the creation and management of the company were students in the Music Industry program. Students also participated in a panel discussion on careers in the Music Industry.